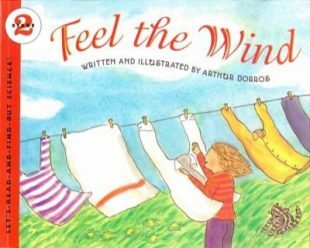 Feel the Wind, Arthur Dorros, NY: HarperCollins, 1989. Construct a weathervane. Place it in a location so that it can be seen from nearby windows. Create and fly kites using information from sources such as Catch the Wind! Research various things that are propelled by wind, such as gliders, hot air balloons, windmills, sailboats. Describe how each works. Watch daily weather reports on television or the Internet. Listen for forecasts about the wind. Using the library catalog, look for stories about the wind. Suggestions: Bizzy Bone and Uncle Ezra, Gilberto and the Wind, The Turnabout Wind, The Wind Blew. Locate and learn a poem about the wind. Windy Day: Stories and Poems, collected by Caroline Feller Bauer, could be a good source. Write a story using wind as a central subject. Examples: describe a tumbleweed, or a seedpod’s adventures as it is carried along by a wind, or the pivotal effects that storm or gentle winds have on human characters in a story. Special thanks to Anne Morrison and Sue Penny, Librarians, El Paso Independent School District.